I'm so excited about the "Pinboard to Home" series we're starting this year! I've had so much fun working on my first pin-inspired project for January (that I'll show you later this week), but I wanted to share another project we tackled for holiday gifts thanks to Pinterest. Actually taking this idea from one of my Pinterest boards, attempting it myself and loving the result, is one of the reasons I started the new monthly series! 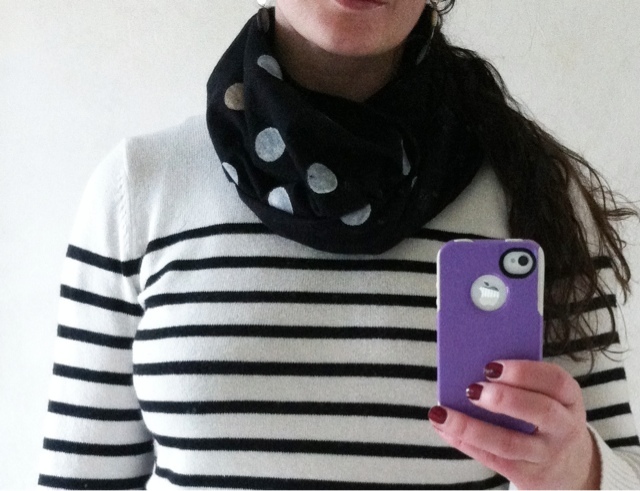 It's a new-sew polka dot infinity scarf made from a t-shirt. Awesome! You can catch the full how-to, which is really simple, by clicking on the source link below the pic. I just want to share a few things I did a little different and found helpful along the way. I started by visiting the men's clearance rack at Target. The larger the t-shirt you use, the longer the scarf, and the more times you can wrap it around your neck. I grabbed a couple of XXL black and white men's tee's that felt super soft and were a good quality cotton. 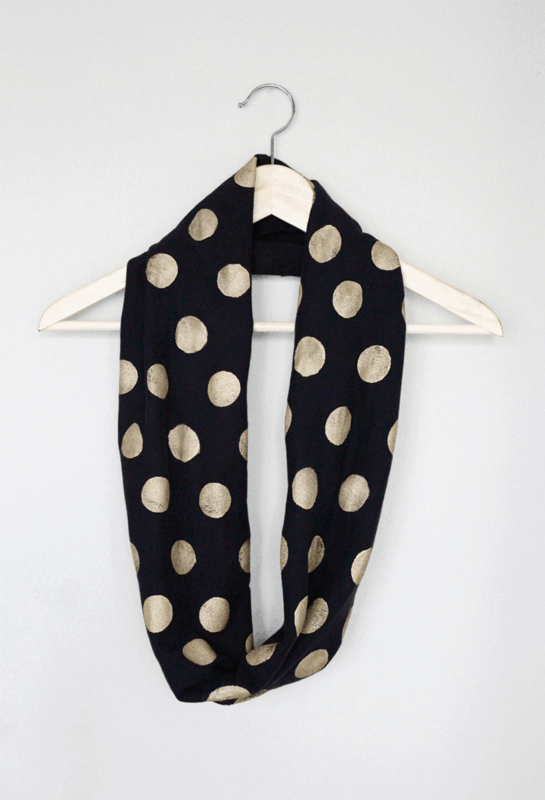 The first scarf I did at night (boo for bad lighting), and I went with a black scarf with large gold dots. After cutting the bottom of the shirt off, I did sew the raw edge using a stretch stitch on my sewing machine before grabbing the paint. I used some of the Martha Stewart "Golden Pearl" paint that I've been slapping on everything lately. I didn't measure, just did a totally random pattern. I placed a paper under the scarf to get a half dot on the edges. The most useful method I found was to use the ironing board. I worked on the portion of the scarf that was on top of the board and then carefully rotated the scarf until it was all done. I left it on the ironing board to dry. If you don't use an ironing board, you can simply lay the scarf flat, paint one side and once it's dry, flip it over to do the other side. In the morning, I liked it enough to make two more. This time I used some white fabric paint alone, and then mixed some into the metallic craft paints. The paint on the first scarf dried a little hard, so you could also add a fabric medium to the paint, so it doesn't dry so stiff. This scarf was another black one, but this time I did go with a pattern. Using the very complicated method of eyeballing it, I alternated rows of four dots and five dots with white paint. I left a few random dot slots open so that I could go back and add another colored dot. After I finished the white, I went back with a mix of white and Martha's "Vintage Gold" and filled in the blanks with a gold dot. The difference is subtle but I like it. The last one was a white scarf and I followed the same steps above, but this time alternated rows of 3 and 4, with a mix of gold and silver dots. And here it is double looped for more of a full/snug fit. After seeing the dots here, I went back and gave the white dots another coat. The dark fabric just soaks up the lighter paint color, so either go thick with the first coat or just go back over them a second time. Either way, it was a totally easy and very inexpensive project! Now to go back and make one for myself...I'm feeling something fun for spring! Anyone else busy on a Pinterest project? I would love to hear what you're up to! 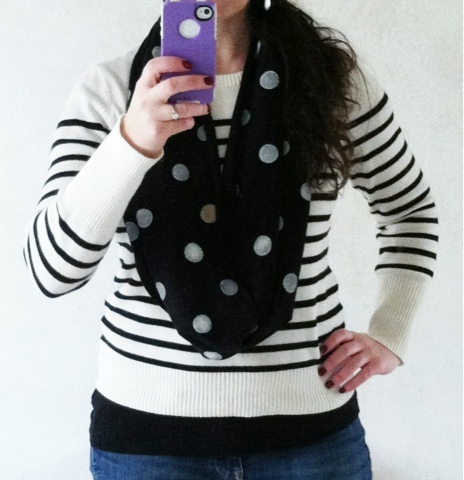 *Linking up to the Pin It - Make It Link Party!